Zoysiagrass (Zoysia spp. Willd.) is a perennial warm-season turfgrass commonly grown in Louisiana. It has recently grown in popularity because of its durability, low mowing requirements and its lush dark-green color. It grows well in warm, sunny areas and can tolerate partial shade. Compared to other turfgrasses, zoysiagrass also has a high tolerance for cold temperatures. There are several course- and fine-textured species and cultivars available. 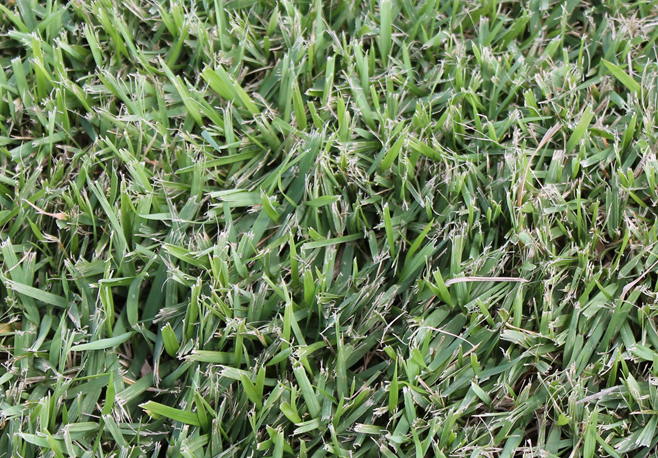 Zoysiagrass is a medium-to-fine-textured turfgrass that feels stiff to the touch. It has dark green, narrow leaves that are sharply pointed or tapered at the tip. Leaf-blade widths can be wide or narrow depending on the particular species. It produces a singular seed head that is red-to-purple in color with small white flowers. Zoysiagrass produces stolons (aboveground stems) and rhizomes (underground stems), both of which allow it to spread laterally. It has a thick, dense growth habit. Soil Type: Grows in a range of soil types and can tolerate dry soils better than other common turfgrasses. Soil pH: Prefers slightly acidic (< pH 7) soils, with the ideal pH between 6 and 7. Always follow soil test recommendations to achieve desired soil pH. Light: Grows in full-sun areas but can also tolerate partial shade. Growth Rate: Spreads slowly via stolons and rhizomes. Mowing and Traffic: Mow at 1 to 2 inches routinely during the growing season. Coarse-bladed zoysiagrass needs to be mowed higher, while narrow-leafed zoysiagrass can tolerate lower mowing heights. Never remove more than one-third of the leaf blade height at one mowing. Mowing at the appropriate height is key in preventing scalping and reducing weed encroachment. Zoysiagrass has a high tolerance for wear and traffic but recovers slowly. Fertilization: Fertilize with up to 2 pounds of nitrogen per 1,000 square feet per year. Fertilizer should be applied from midspring to midsummer. Never apply more than 1 pound of nitrogen per 1,000 square feet per application. Follow soil test recommendations for proper fertility. Dethatching & Aeration: Thatch can develop over time, especially in zoysiagrass, and may need to be reduced through vertical mowing. Compaction can form more quickly on finer-textured soils and in areas where there is high traffic. Dethatching or aeration need to be performed in late spring to summer when the turfgrass is actively growing. Establishing zoysiagrass in the lawn can be achieved via seeds or sod. Zoysiagrass is most commonly established via sodding.